Charles R. Thatcher (Charles Robert), 1831-1878. Song Lyrics (descriptions and parodies) by Charles R. Thatcher about Melbourne, and Victoria, Australia. Cover shows the price is sixpence. The songster was published and printed by Charlwood and Son in Bourke Street, Melbourne, while the retailer is given as Cole's Book Arcade in Bourke Street, Melbourne. Music is not provided, but a note regarding what tune the song should be sung to is given at the start of the lyric. 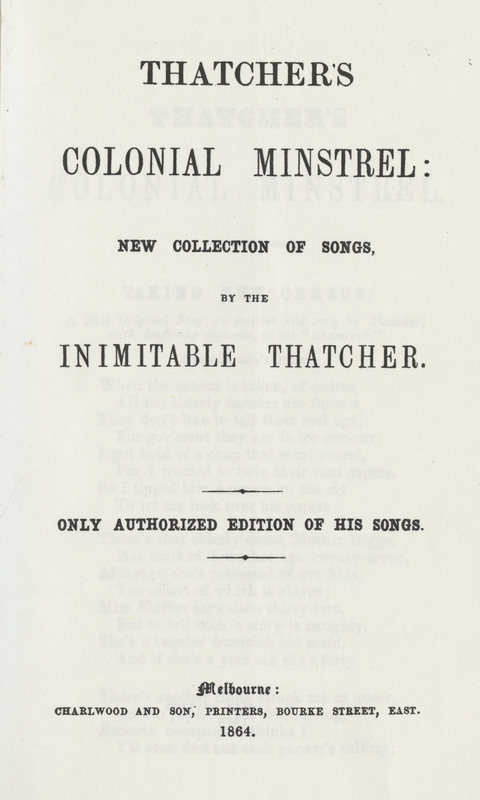 Charles R. Thatcher (Charles Robert), 1831-1878., “Thatcher's colonial minstrel: A new collection of songs by the inimitable Thatcher.,” ourheritage.ac.nz | OUR Heritage, accessed April 22, 2019, http://otago.ourheritage.ac.nz/items/show/10641.